Be the star of your next dinner party when you show up with this delicious and flavourful hummus trio! 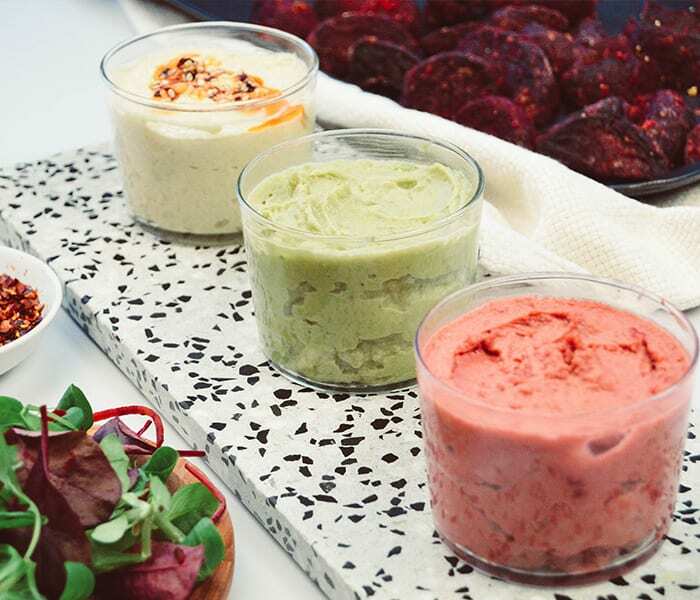 Blend our nutritious and vitamin-filled Beetroot Wedges and Avocado Halves with spices and and chickpeas to create healthy, colourful hummus varieties perfect for dipping and scooping. Goes great with pitta bread, veggie sticks, crisps, or whatever you please! Place the Roasted Beetroot Wedges on a baking tray and cook as per instructions on the pack. Defrost the two Ripened Avocado Halves. Place all other ingredients in a blender and blitz until smooth, add in a small bit of water at a time for a less dense consistency. Portion 1, leave as is, as this will be the original hummus. Portion 2, add in a few beetroot wedges and blend again until smooth. Portion 3, add in the avocado halves and blend until all of the avocado is incorporated. Serve with tortilla chips, on a salad or in a sandwich!